Unless you’ve been on a media fast, you’ve undoubtedly heard by now that the royal baby was born this week. On Monday, there were two million tweets on him, and he hadn’t even been given a name. Now that his moniker has been revealed, you can bet George Alexander Louis will become a household name. It struck me on Monday, that George has the same birthday as my Compassion child in Kenya. But I am the only one who tweeted about that. I did hear via social media that it was Selena Gomez’s birthday. Later I learned that Albert Brooks, Danny Glover and Don Henley also share the same day. But Joseph Ngutayon stayed solidly out of the news. The Royal baby lived his first hours in front of the eyes of millions (even when he was behind a door), all wanting to catch a glimpse of the designer sleeper he was wearing. Joseph has lived his fourteen years in small village in Kenya, surviving on the single meal a day and school outfit supplied by my $38 bucks a month. And in the midst of thinking about this contrast between George and Joseph, it suddenly dawned on me that we don’t get to pick where we are born. Birth just happens to us. The Royal baby didn’t get to choose his parents, nor did my Compassion child. And yet what different lives they will have, simply because of the birth canal through which they arrived. Many of us will never know the luxuries George will have at his fingertips. However by the same token, most of us experience daily luxuries Joseph doesn’t even know to dream about. And so I am left this week one more time to wonder… Is it just the luck of the draw that we are born where we are? Should I simply count my blessings that I was born in a place where I have to diet to miss a meal? Where daily I wake up with a roof over my head? Where I open my closet and choose between outfits to wear? Or is it more than just luck? Is it, (I say cringing to myself) responsibility? In the long run, it all comes down to perspective. With our eyes on Great Britain this week, we can keep our focus on the babies born who will never want for anything. Or we can uncomfortably shift our gaze to the millions of babies are born each day who won’t have time to think about what they want. They’ll be too busy trying to get what they need. I heard a statistic from a book I’m reading by the president of World Vision that floored me. If you make $40,000 a year, you are in the top 1% of the world’s economy. Read that sentence again. And now hear this one: If you make just $13,000 a year (poverty level in most places of our country), you are in the top 10%. We live in Santa Barbara, renting a two bedroom cottage a couple miles down the road from Oprah’s neighborhood. So most of the time, I feel very poor. However this statistic reminds me, it’s all about who I’m comparing myself to. Will I, along with the rest of the world, keep my eyes on George Alexander Louis, and stay focused on what “little” I have? Or will I keep my eyes on Joseph, whose picture is on my fridge, and realize the wealth I’ve been given? I pray for the courage to do the latter. Yes! Preach it! Thank you for passing on some grounding. We do have responsibility with privilege, no matter how much or little that is, because it all is a gift. Such a great reminder on keeping perspective! 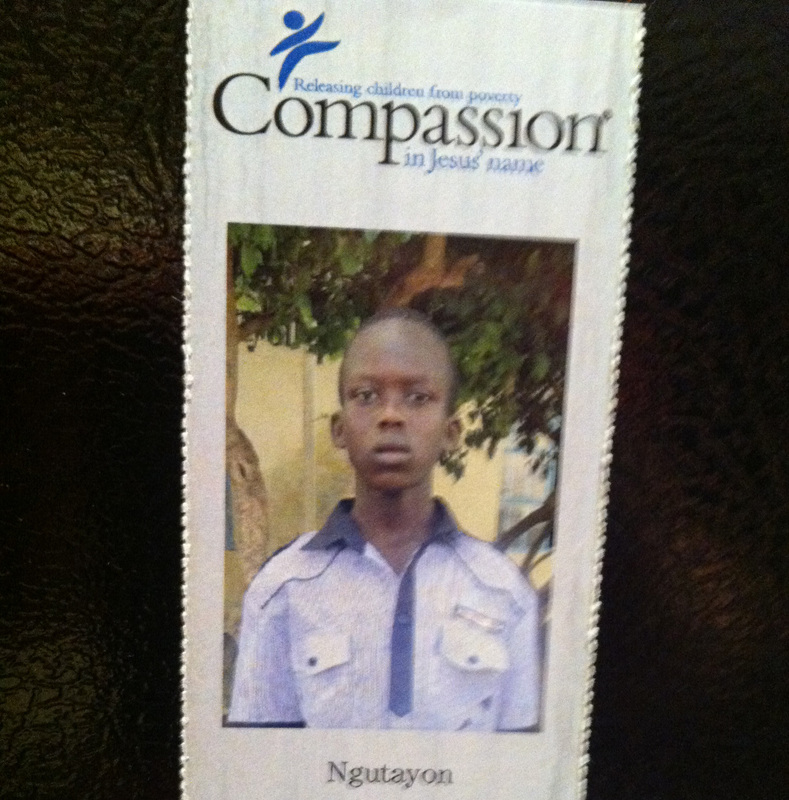 I just adopted a Compassion child two weeks ago. Your blog really put it into perspective for me about how blessed we truly are, and what great needs exist. Thank you. We all need that reminder. There is always someone richer, someone poorer, someone thinner, someone fatter, taller,shorter, smarter……right? The gift is to appreciate who we are and share our gifts whatever they may be.